The Pittsburgh Penguins were swept out of the first round of the playoffs by the New York Islanders, opening the door to plenty of questions surrounding the roster composition moving forward. The team made a few big trades during the season to change the look of their group, sending out names like Derick Brassard, Riley Sheahan, Daniel Sprong, Carl Hagelin and Tanner Pearson at various times. While that ended up with a deep group of defense with plenty of talent, it also now may lead to more deals having to be made this summer. That may not come as a surprise, given the state of the blue line right now. Six players are currently under one-way contracts for next season, all of them with cap hits of at least Jack Johnson’s $3.25MM. That makes for an expensive group, especially when you consider the fact that Marcus Pettersson, a restricted free agent, deserves a substantial raise after becoming one of the team’s more reliable options. 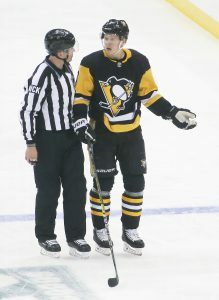 Mackey suggests that the one skating for a new team come 2019-20 may well be Olli Maatta, who ended up a healthy scratch for three games after his -2 performance in game one. This certainly isn’t the first time that Maatta has been considered a potential trade candidate, in fact his name has surfaced on a consistent basis since signing his six-year, $24.5MM contract in 2016. While the 24-year old defenseman is not a liability, he also hasn’t taken the necessary steps to make him an untouchable on the Pittsburgh roster. That’s not to say that there wouldn’t be interest in him even with three years and more than $12MM still left on his contract. As Rutherford says, there will be plenty of teams looking for defensive upgrades this summer and he is still a potential top-four option on many of them. His cost certainty may actually be an attractive component to any trade, given his relative youth and the soaring costs of restricted free agents. The question then becomes whether the Penguins group of defensemen is good enough to compete for a Stanley Cup next season without any other additions. Rutherford seemed to think so when he told reporters including Josh Yohe of The Athletic that this was the best blue line the team has had since he joined them. Rutherford of course joined the Penguins before the 2014-15 season, and won back-to-back Stanley Cup championships in 2016 and 2017. Maatta, Kris Letang, Brian Dumoulin and Justin Schultz were part of both titles, while Johnson, Pettersson and Erik Gudbranson were all added in the past year. Defenseman Chris Wideman is on the move for the third time this season. The impending free agent has been traded by the Florida Panthers to the Pittsburgh Penguins, reports Sportsnet’s Chris Johnston. TSN’s Bob McKenzie adds that forward Jean-Sebastien Dea heads the other way to Florida. Wideman began the season with the Ottawa Senators, but was traded to the Edmonton Oilers in November for a sixth-round pick. After he wasn’t a fit in Edmonton, Wideman was sent to the Florida Panthers as part of the package for Alexander Petrovic. He now joins his fourth team of the season in Pittsburgh, but it may be his best opportunity yet at play time. Having played just six games combined since leaving Ottawa, Wideman now joins a team that is currently without Kris Letang, Brian Dumoulin, and Olli Maatta and will ask he and another new acquisition, Erik Gudbranson, to help make up for their absences. For now, Wideman will report to AHL Wilkes-Barre/Scranton but will likely be recalled if Letang and Dumoulin remain sidelined. Meanwhile, Dea has also been on the move frequently this year. The 25-year-old forward played 20 games with the New Jersey Devils after being claimed on waivers earlier this season, but returned to Pittsburgh via waivers afterward. Dea has spent the majority of the season in the AHL, only playing three games for the Penguins. He now heads to Florida where he will try to prove he is worthy of regular play time. Dea is currently a candidate for Group 6 free agency at the end of the season, so his time with the Panthers could be short-lived. The Pittsburgh Penguins suffered some injuries in their defense corps recently, so have moved quickly to strengthen the group. Pittsburgh has acquired Erik Gudbranson from the Vancouver Canucks in exchange for forward Tanner Pearson. Gudbranson, 27, is in the first season of a three-year extension signed with Vancouver last February and will carry a $4MM cap hit through the 2020-21 season. That makes this a somewhat surprising move given the Penguins already have a fair bit of money invested into their blue line. The team just gave Jack Johnson a five-year deal last summer and have gotten little back for their money, and still have Kris Letang, Justin Schultz, Brian Dumoulin and Olli Maataa all earning at least $4MM per season. While sending Pearson the other way clears out $3.75MM itself, the team has moved money out of the forward group that had already been criticized for not being deep enough. Getting the type of player that Gudbranson is was something we’ve talked about for a while. He wasn’t available, to my knowledge, until today. We are very pleased to bring Erik in to join our team. The nice thing about Erik is he’s a character guy, he’s a team guy. He’s going to help the room. He’s going to make guys feel more comfortable. He’s got experience playing in the league. Perhaps most notable in that explanation is the idea that Gudbranson is going to make his teammates “feel more comfortable.” While Rutherford doesn’t specify exactly what he means, it very well could be that he wanted a player who could stand up for his teammates on the ice. The Penguins have been looking for an answer to Washington Capitals forward Tom Wilson’s physical style for some time, and after trading away Jamie Oleksiak didn’t have a player who measured up. Gudbranson certainly does that, though the rest of his game brings about more questions. Selected third overall in 2010 by the Florida Panthers, Gudbranson never did develop any offensive game and is strictly a defensive defenseman. In 448 career regular season games the 6’5″ behemoth has just 62 points and hasn’t recorded more than ten in a single season since 2014-15 (the only year he has done so). He has also posted incredibly low possession statistics because of that lack of offensive skill, something that the Penguins will have to hope doesn’t hurt them down the stretch and into the playoffs. Obviously Pittsburgh has other options to move the puck, including two elite offensive options in Letang and Schultz, but in today’s NHL Gudbranson may continue to struggle even in a sheltered role. That’s obviously why Vancouver made him available just a year after extending him, and for a player who has experienced struggles of his own in Pearson. The 26-year old Pearson was only acquired by the Penguins a few months ago in exchange for Carl Hagelin, and didn’t quite find the success that the team had hoped for. After failing to score a single goal in 17 games to start the season with the Los Angeles Kings, he recorded just nine goals and 14 points for the Penguins through 44 contests. If Pearson can get back to the perennial 40-point player that he was for a few years in Los Angeles the Canucks could have a perfect winger for one of their good young centers, but that may be asking a lot at this stage in his career. Earlier in the day, Golden Knights head coach Gerard Gallant indicated that winger Max Pacioretty could be a healthy scratch tonight. However, a team spokesperson indicated to David Schoen of the Las Vegas Review-Journal that he is indeed dealing with a minor issue and that team management ultimately decided to hold him out of the lineup. The veteran has rebounded nicely after a rough start to his season, collecting 16 points over his last 14 games but now will see that streak interrupted. They did get some good news on the injury front, however, as center Paul Stastny returned to the lineup after missing the last 30 games with a knee injury. Canucks defenseman Erik Gudbranson was held out of Thursday’s game due to back spasms, notes Ben Kuzma of the Vancouver Province. This comes on the heels of him missing three games earlier this month with a neck issue. It’s worth noting that Vancouver has not pulled a blueliner up from AHL Utica, suggesting that they feel that this is a day-to-day issue. The 26-year-old has eight points and 45 penalty minutes while logging just over 19 minutes a night in 30 games this season. Although a full-time spot in the lineup isn’t guaranteed for center Lias Andersson, the Rangers don’t intend to send him back to AHL Hartford, reports Brett Cyrgalis of the New York Post. The 20-year-old has moved up and down the lineup while spending some time on the wing in an effort to find him a defined role but that has yet to come to fruition. However, the team has clearly decided that keeping him up with New York is the best course of action for the time being, even if it results in him being a healthy scratch or playing limited minutes. Kings defenseman Dion Phaneuf has been classified as week-to-week with an upper-body injury, notes Zack Dooley of LA Kings Insider. The veteran has not fared well this season, posting just a single assist while logging less than 15 minutes a night. With Los Angeles expected to be selling, Phaneuf’s deal (which carries a $5.25MM cap hit after Ottawa’s retention) is one they’ll undoubtedly be looking to move but this injury will make doing so even more difficult. When the Calgary Flames recalled Rasmus Andersson yesterday, it was an indication that defenseman Travis Hamonic’s facial fracture, suffered in the team’s opener, was going to cause him to miss some time. However, the team has now officially announced that Hamonic has been placed on injured reserve. The team has labeled his status as week-to-week with no specific timeline for a return. Hamonic suffered the blow in a first period fight with the Vancouver Canucks’ Erik Gudbranson and was forced to leave the contest early. Hamonic has been sidelined frequently in his career, with his 74 games for Calgary last season actually setting a new career-high. Hamonic missed eight games for the Flames in his first season with the team, but spread throughout the season and not more than four at a time. The Flames would be fortunate if this injury only costs Hamonic four games. In the meantime, Andersson, fellow rookie Juuso Valimaki, and veteran depth defender Dalton Prout will be asked to pick up the slack in Hamonic’s absence. The rival Edmonton Oilers are getting one of their top defensemen back from injury, as the team announced that Kris Russell has been activated from the injured reserve. Russell’s injury was never disclosed by the team, nor was a timeline given, making his activation both a surprise and not a surprise at all. Russell traveled with the team to Europe and returns in time for the Oilers’ season opener against the New Jersey Devils in Sweden. Russell will skate with rookie and 2018 first-round pick Evan Bouchard, as he makes his NHL debut. In a corresponding move, Edmonton has returned young puck-moving blue liner Ethan Bear to the AHL’s Bakersfield Condors. Bear has been established as the next man up on defense, so if Bouchard’s early action does not impress and he is returned to junior, expect a prompt recall for Bear. The New York Islanders are keeping defenseman Dennis Seidenberg and forward Stephen Gionta with the team on extended PTO’s, notes Newsday’s Andrew Gross. Both veterans played for the Islanders last season and are familiar with the roster and seem willing to hang around in case an opportunity to officially return arises. Per Gross, head coach Barry Trotz called the pair “long-term insurance”. Seidenberg and Gionta will participate in practice and wait to see how the early season unfolds for the Isles, both in health and performance. Neither veteran has much of a ceiling at this point in their career, but are experienced, serviceable, hard-working pros who could step in if needed and provided some immediate support. The John Tavares saga wasn’t very fun for the New York Islanders, as they watched their captain and face of the franchise head to the Toronto Maple Leafs in free agency. It also might not have been the best time for an opposing center, as David Krejci tells Joe Haggerty of NBC Sports. Krejci didn’t hear from anyone in the Boston Bruins organization during their own courtship of the star free agent, one that many believed would force the team to move on from one of their more high priced forwards. There’s no one in the Boston organization with a higher price tag than Krejci, who also happens to play the same position as Tavares. With all that finished now, Krejci will get his chance to show why he earned his own big paycheck by taking on Tavares and the Maple Leafs this season. The Bruins knocked the Maple Leafs out of the playoffs last season by smothering top options like Auston Matthews and William Nylander with two defensively capable centers in Krejci and Patrice Bergeron. Toronto had little answers this spring, but will now be heading into the 2018-19 season with arguably the best group of centers in the league. The Bruins will have to find an answer for Tavares and Matthews if they want to get by them once again, given that the two teams seem destined for a collision in the postseason once again as two of the top contenders in the Atlantic Division. The Ottawa Senators have announced the hiring of three additional scouts, hiring Kyle Flanagan, Peter Havluj and Christian De Blois. Each will have their own individual territories, with Havluj spending his time in the Czech Republic. The Senators notably passed on Czech forward Filip Zadina in the most recent draft, but may get some more insight into the country’s top prospects going forward. Ottawa’s scouting staff is notoriously small, but has found some solid results in the last few drafts in players like Alex Formenton, Filip Chlapik and Jonathan Dahlen, all selected outside of the first round. Erik Gudbranson spoke to Luke Fox of Sportsnet about several pressing matters for the Vancouver Canucks this season, including the now-vacant captain position after Henrik Sedin’s retirement. Gudbranson believes the team needs a captain this season and suggests that “guys would be excited” about Bo Horvat as a candidate. Horvat is entering his fifth season in the NHL and has long been expected to take over a leadership role on the team when the Sedin twins finally called it quits. The 23-year old center wore an “A” with the London Knights and could be the center of the next wave of Canucks playoff hopes. Is Vancouver Looking To Make A Big Splash? It is no secret that the Vancouver Canucks do not operate like a typical rebuilding team. Make no mistake, the team has accrued plenty of talented young building blocks over the past few years: Bo Horvat, Brock Boeser, Elias Pettersson, Jonathan Dahlen, Adam Gaudette, Quinn Hughes, Olli Juolevi, Thatcher Demko, Michael DiPietro and the list goes on. However, the team has also gone about business as usual, signing free agents and at times even overpaying to add veterans to the roster. Over the past two off-seasons, Vancouver has taken roster spots away from younger players in order to sign the likes of Erik Gudbranson, Sam Gagner, Michael Del Zotto, Anders Nilsson, Thomas Vanek, Darren Archibald, Jay Beagle, Antoine Roussel, Tim Schaller and more. The moves have put the team no closer to being a contender. The Canucks have not advanced past the first round of the playoffs since their 2011 Stanley Cup Final appearance and have failed to reach the postseason altogether in each of the past three years. It seems unlikely that the trend will change any time soon, either. The Province’s Ed Willes is worried that things might get even worse. Willes claims that recently departed team president Trevor Linden ” lost his job because he favored a patient, methodical approach to the team’s rebuild”. With Linden gone, the team has been even more aggressive than usual this summer in targeting older players. Vancouver made an offer to John Tavares that was rejected and more recently has been linked to Erik Karlsson. While he isn’t convinced the team has the means to acquire Karlsson, the fear is that some player will come along on the trade market that they can afford and will deplete their promising prospect ranks to acquire. Willes firmly believes that Benning and the Canucks are in the hunt for a cornerstone player, no matter the cost. Just as it has in recent years, even adding an elite veteran player is unlikely to get the Canucks to where they want to be. As it is currently composed, the team lacks the supporting cast to be a true contender. The greatest strength of the organization is the youth waiting in the wings, with at least two goaltenders, four defensemen, and eight forwards under the age of 25 that are all almost universally expected to be NHL regulars for a long time to come. Yet, the cost of adding a marquee player would be a package of those exact players or upcoming (early) draft picks. The patient approach that Linden fought for could transform the Canucks into one of the league’s top teams in five years time. An impatient acquisition could cost them what progress they have made and, in Willes’ opinion, cost them fans as well. So perhaps the question is not “is Vancouver looking to make a big splash?”, but “should Vancouver be looking to make a big splash?” and the answer seems to be a convincing no. The NHL preseason is almost here and teams around the league are just hoping to have their entire roster healthy enough to suit up. The Vancouver Canucks aren’t going to have to worry about Erik Gudbranson, as Rick Dhaliwal of Sportsnet reports that the big defenseman has experienced no setbacks from his shoulder surgery and should be ready for the start of the season. Gudbranson injured his shoulder in November of last year but wasn’t shut down for surgery until mid-March. The 26-year old Gudbranson has played just 82 games total in the two seasons since joining the Canucks, limited by injuries on a near daily basis. Originally selected third overall by the Florida Panthers, there are many who have pointed to his poor possession statistics as reason to believe that Gudbranson can’t be an effective top-four option in the NHL. Vancouver GM Jim Benning clearly disagrees, signing the 6’5″ 220-lbs defenseman to a three-year $12MM extension in February. Though Gudbranson doesn’t put up points, he is a feared opponent in his own end willing to engage physically and able to clear the front of the net. At his best, he’s a weapon on the penalty kill and can balance out a pairing playing against a more offensively-minded defenseman. Unfortunately the Canucks haven’t seen much of him at full strength, something they hope to experience this season as they look to compete with a younger core. Vancouver has moved on from franchise icons in Daniel and Henrik Sedin, and are now placing the offensive burden on players like Bo Horvat and Brock Boeser. Gudbranson and other veteran additions like Antoine Roussel, Tim Schaller and Jay Beagle will be tasked with keeping the puck out of the Vancouver net and any attackers off the young player’s backs. Earlier today, the University of Michigan announced that defenseman Quinn Hughes, the Vancouver Canucks 2018 first-round pick, will return to the team, crushing hopeful fans of having the smooth-skating blueliner from starting the season with the Canucks. Sportsnet’s Rick Dhaliwal reports that he interviewed Hughes’ agent and father, Jim Hughes about the decision the Hughes family had to make last night about him returning to college for another season. TSN’s Ray Ferraro suggests the team take a similar approach to Quinn Hughes to the direction that Boston took when they drafted Charlie McAvoy in the first round back in 2016. The Bruins allowed him to return to Boston University, then play at the World Juniors and then after his college season signed him and brought him in to play in six playoff games for them. Ben Birnell of the Observer-Dispatch wonders how the resignation of Trevor Linden, the Canucks president of hockey operations, will affect the team’s long-term standing with their AHL affiliate, the Utica Comets. Linden has been a supporter of Vancouver’s affiliation with the Comets over the years despite the distance between the two cities and with the six-year affiliation agreement between the two teams up in less than a year, there are questions whether Linden’s departure could end their long-time affiliation. Utica has been home to many of the Canucks top prospects and will likely be a focal point for the team’s depth at the forward position as several key prospects are likely going to be headed for Utica this season. JD Burke of The Athletic (subscription required) takes a look at what forward Tim Schaller will bring to the Canucks, especially pointing to the veteran’s ability to play high-quality defensive hockey. Schaller, who was one of three bottom-six forwards to sign on July 1 to multiple-year contracts along with Jay Beagle and Antoine Roussel, was the one with the most reasonable deal. He signed a two-year, $3.8MM deal and might be worth that money, according to the scribe, who breaks down the 27-year-old’s positive qualities, which also include solid penalty killing skills. TSN’s Jason Brough reports that while the loss of Hughes is likely going to keep the team’s defense the same, he wouldn’t be surprised if Vancouver makes a move to improve a below average defense that at the momemt is made up of Alexander Edler, Chris Tanev, Erik Gudbranson, Michael Del Zotto, Ben Hutton and Troy Stecher.